If you're after watercolour paint brushes that should last for years, look no further. It's easy to see why these were Queen Victoria's favourites – they're probably the best watercolour brushes you can buy. Queen Victoria commissioned Winsor & Newton to produce for her the finest watercolour brushes possible. The company, which already held a Royal Warrant, rose to the challenge. The formula has changed slightly for the modern age, but Winsor & Newton has preserved the quality and heritage of this range, named Series 7 after her favourite brush size, no 7. Today the Series 7 range is available in 13 sizes, from 000 to a healthy size 10. The head shape is round and the range is also available with short handles – ideal for the painting of miniatures. Series 7 brushes are handmade in England by brushmakers with over 40 years of experience. Every strand of the finest Kolinsky sable hair is measured, combed and carefully rolled into a precise dome shape to ensure the creation of the perfect point. Once tied and inserted into a nickel-plated ferrule, each brush head is then checked for blunt hairs under a magnifying glass before being securely fastened to the black polished handle. But it doesn't end there. It's vital that the balance, shape and point of every Series 7 brush is perfect, so each one is then tested by hand. The larger brush sizes are packed into individual presentation boxes that include a tag with the brushmaker's name. This personal touch shows a real respect of the brushmaking craft, reaffirming the high-quality product that you've just invested in. The smaller-sized paint brushes won't break the bank (they're priced from £10.99/$14 for size 000), and it's a good way to experience the quality of Series 7. Upwards from the size 6, however, the price might make you hesitate. Size 7 costs £89.99/$115 and the range stretches up to £329/$420 for a size 14. But while you hesitate, let's explore why the Series 7 Kolinsky Sable brushes are often referred to as the world's finest. Aside from the obvious quality in materials and production, it has to be in the experience of painting. Queen Victoria's favourite brush, size 7, seems a good place to start. With its smooth, black handle it looks smart and feels comfortable in the hand. It's a medium-sized brush and is reasonably thirsty, soaking up a decent amount of paint that produces an even flow and coverage in one movement. The incredible softness of the brush is immediately apparent as it easily glides across the paper, holding a good edge when used straight, but also allowing the brush tip to cleanly follow a swirling action without any resistance or bristles breaking out. This amount of control really does confirm its superiority and makes it a pleasure to use. Whether lightly or heavily laden with paint, the shape of the brush holds incredibly well. Sizes 1, 0 and 00 were also used with the same clean and controlled results. These smaller sizes would be perfect for fine, detailed work. 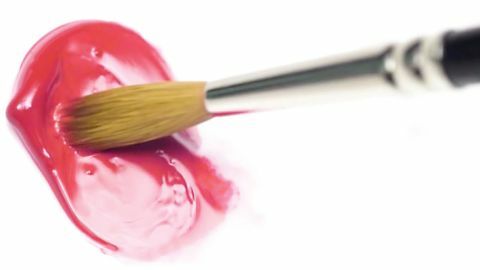 The Winsor & Newton Series 7 Kolinsky Sable brushes will undoubtedly boost your enthusiasm for watercolour. They enhance the overall experience and have the potential to improve your results. If looked after well, these brushes should last years, maybe even a lifetime, in which case the extra cost of this quality product can be justified.